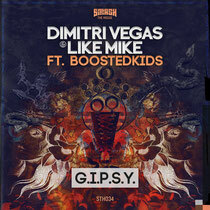 Dimitri Vegas & Like Mike get set to release their new track ‘G.I.P.S.Y.’, co-produced with Italian duo Boostedkids (Dany Spada and Frankinelli), on Smash The House on 11 November. The single, which originally debuted as part of the official Tomorrowland 2013 After Movie, is a blend of traditional gypsy music, haunting flutes, wind and string instruments, which are juxtaposed against a thundering, driving beat. News of ‘G.I.P.S.Y.’s release comes after the recent announcement of the pair’s forthcoming collaboration with Borgeous and DVBBS, ‘Stampede’ (due November 18th on Spinnin’ Records), and leads the way for the large volume of music set to come out from the Belgian brothers over the coming months. Their rise to the #6 position in the DJ Mag Top 100 DJs Chart looks set to prepare the duo a top 2014. Check it out below.